I just wanted to give a bit of a shout-out to a splendid new Vietnamese cafe called Caphe House that has recently opened up on Bermondsey Street, tucked a stone's throw away from London Bridge station. It's a small, neat place with modern art pictures on the wall that for some reason makes you feel healthier and virtuous the minute you walk in - must be the wonderful smells emanating from the counter. They offer the perfect alternative to the usual boring British office lunch - if you're tired of soggy sandwiches, you can instead pick yourself up a zingy noodle salad with roasted meats, prawns or tofu, fresh summer rolls and banh mi (Vietnamese-style pate baguettes sandwiches stuffed with herbs and crudites). Everything is seasoned with wonderful chilli sauce and fish sauce marinades, dotted with fresh coriander and mint and packed with crunchy fresh strips of vegetables. 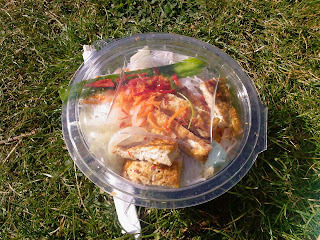 My lunch pictured above was perfect for a sweltering day: fresh rice noodles dressed with fish sauce, lime juice and fiery chilli sauce, topped with lemongrass-infused crispy tofu and packed out with crunchy strips of pepper, cucumber and carrot.